Randy Susan Meyers found the subject for her latest novel in the morning news. She read about an immense Ponzi scheme that effected thousands across the nation and realized she could tell the story the right way. Her bones resonated sympathetically with the notes plucked by the subject matter. So that’s what she did. The Widow of Wall Street is a novel about a man perpetrating an immense Ponzi scheme that first brings financial success, followed by ruin. The novel bares the financial, criminal, family, and emotional dynamics. I caught up with Ms. Meyers at Porter Square Books in Cambridge, Mass., a treasure trove of well-curated books with popular appeal, including many by local authors. (Boston is perhaps second only to New York City in the U.S. as a writing nucleus.) 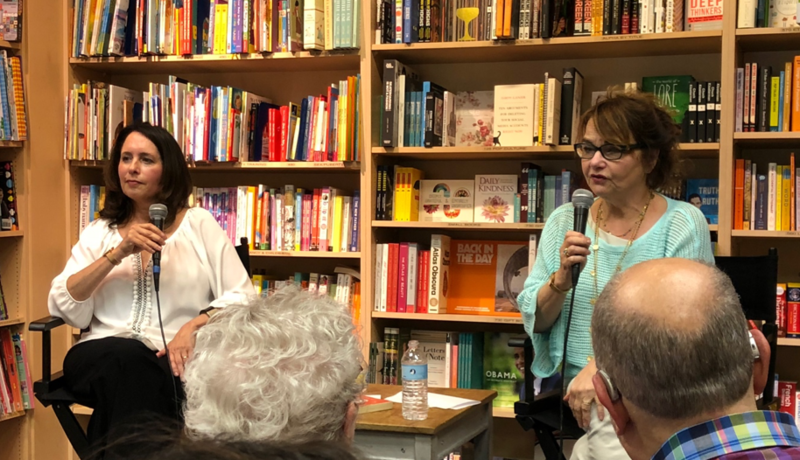 She appeared with author Meta Wagner for a reading and Q and A about her recent book. Ms. Meyers’s background often has served useful to her writing. She’s written books such as The Murderer’s Daughters, The Comfort of Lies, and Accidents of Marriage. Each one uses some element of her varied work life. She tended bar and ran a summer camp. Then she counseled batterers and victims of domestic violence. From those experiences, she said she sharpened her insights into darkness, collateral damage, self-justification, and redemption. All of this fed her immediate connection with the desperation and pain in these news stories. The Widow of Wall Street begins in the 1960s, and Ms. Meyers researched that period, too. “I bought tons of magazines from that period on eBay. I found that was a much better way of doing research… going through the old magazines—Life, and stockbrokers’ magazines from the 50s and 60s—really gave me a sense of what people were supposed to be doing and what they weren’t doing,” she said. But even that wasn’t quite enough to write the novel. As any teacher knows, the deepest way to learn a subject is to teach others. So, “I wrote myself then a non-fiction book about the crime,” she said. It’s something she had done with other books as well. “I just write out a chronology of what happened (nobody can even read it but me), and then I just buttered it in. It was fun.” From there, the book came together readily. Knowing that the author invested so much emotional and subject knowledge, I had to read the work. I purchased a copy of the book, got it signed, and I am very excited to read it.